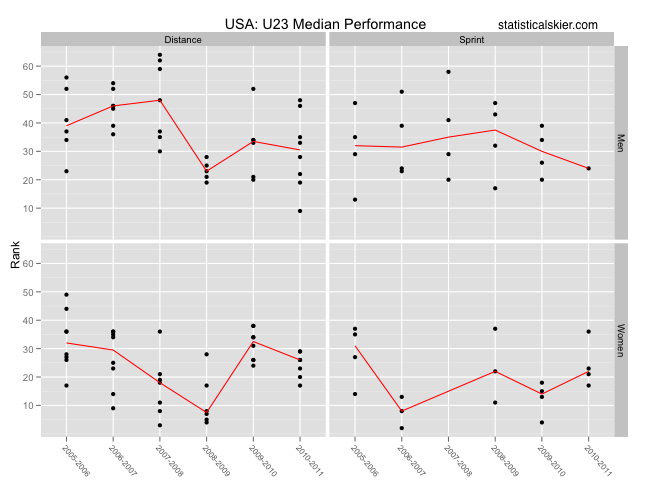 This week is going to be pretty heavy on the WJC/U23 graphs, I suppose, as we wait for the World Cup racing to start up again. 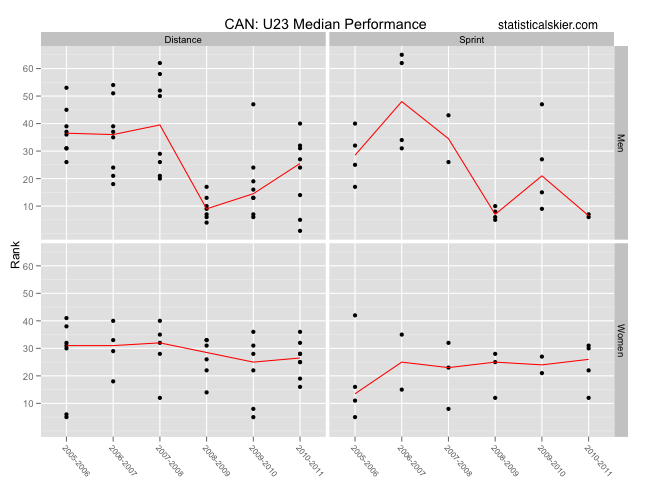 One of the things that has struck me while writing this blog is how much importance and meaning is placed on WJC/U23s compared with how little data they provide in a given year. What I mean is that if we think of a ski race as a measurement of performance, WJCs provides only 2-4 “measurements” for each athlete. That doesn’t add up to a ton of data, given how variable skiers can be, even when they are racing well. That said, they are what they are: a World Championships, so assessments are inevitable. Let’s see what we can see. This should give you a good sense for how, with so little data within each year, that simple summaries like the median don’t always reflect everything we’d like them to about the data. 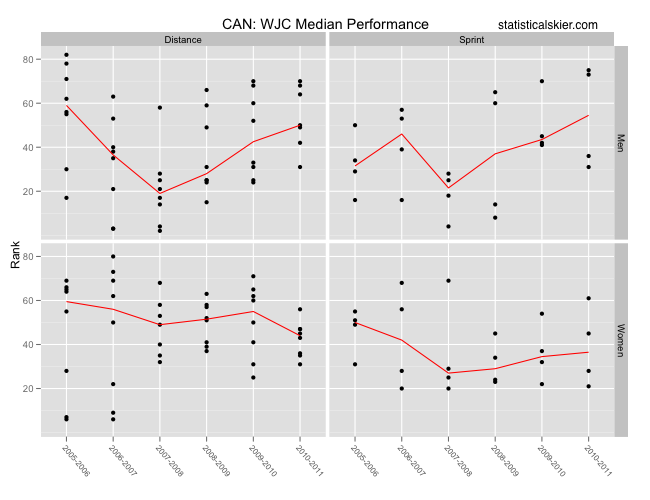 The two clearest trends here are in men’s distance and women’s sprint, with some steady drop-offs in the median over the past three seasons. 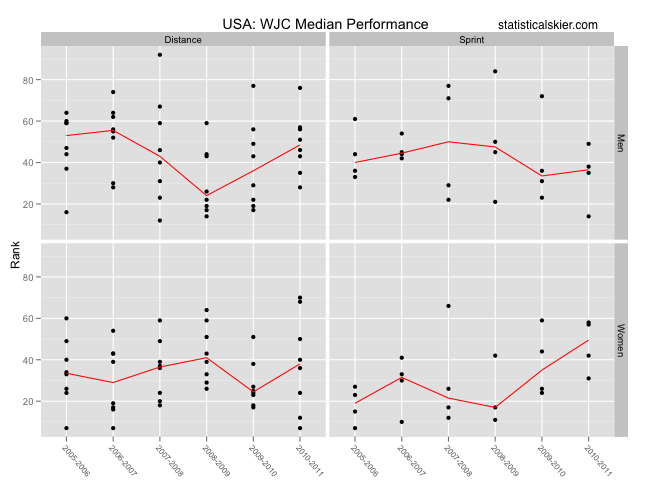 The US women did have some strong sprint results this year compared to the recent past; they just also had some bad ones as well. The Canadian men have also seen some worsening performances over the last several years, partly due to the fact that the second coming of Alex Harvey hasn’t quite manifested itself yet. The women’s crew, on the other hand, seems to have been chugging away quite consistently. The US women have seen things slide back a bit with folks like Morgan Arritola, Liz Stephen moving on to the World Cup scene. Other than Noah Hoffman’s “ok” race netting him a 9th this year, things looked about the same for the men’s distance squad. The Canadian women have been quite consistent in the distance races, with their best result bouncing up and down between 5th-15th from year to year. The men have had some considerably better sprint results over the past three years,which is nice to see. And interestingly, Alex Harvey swooping in to win the last race wasn’t enough to counter balance a fair number of somewhat worse results from other Canadian men. I’ll have another post or two with similar graphs for several European nations later today and/or tomorrow. Posted by Joran on Tuesday, February 1, 2011, at 1:00 pm. Filed under Uncategorized. Tagged assessment, canada, U23, US, WJC/U23. Follow any responses to this post with its comments RSS feed. You can post a comment or trackback from your blog. « What Happens To Successful World Junior Racers?